The Fall Harvest is celebrated world-wide. In Korea, their celebration is called Chuseok (pronounced Chew-sock). 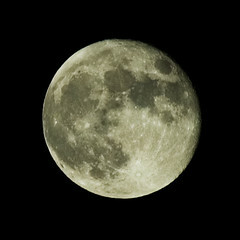 It is the Harvest Moon Festival that always lasts 3 days. Many Koreans slave away with 6-day work weeks and rarely ever take vacations. But on Chuseok, the entire country takes a break. Businesses shut down and restaurants stop serving kimbap. Only the subway and occasional foreign food restaurant are open to the public. Usually this holiday falls in the middle of the week which gives people a nice long, and seriously needed vacation, but this year it fell on a Friday allowing only a 3-day weekend of free time. People take this time to visit with family and enjoy the fall harvest. Chuseok is very similar to American Thanksgiving. Who doesn’t love a holiday centered around food? Traditional foods are prepared from scratch. Even the youngest of girls are in the kitchen learning how to make the various recipes. 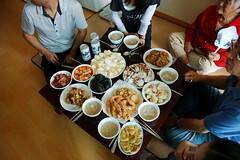 Songpyeon is probablly the most common food prepared. 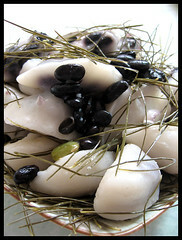 It is a rice cake stuffed with such things as honey, sesame seeds, dried fruit, chestnuts, and bean paste. They’re folded into half-moon shapes and arranged on a bed of freshly-picked pine needles to be steamed. All of my students were very excited about eating these rice cake treats. I would have loved to try one. Another Chuseok tradition is holding ancestral ceremonies. Most people visit graveyards, pull weeds and clean up their ancestors’ resting place. Food is usually left on the graves symbolizing gratitude. This entry was posted on October 3, 2009, 3:46 pm and is filed under Food, Korean culture. You can follow any responses to this entry through RSS 2.0. You can leave a response, or trackback from your own site. Great post! This is really interesting, Tiff.